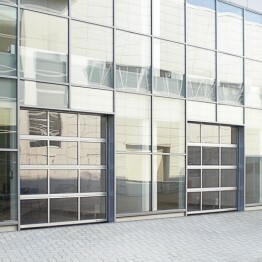 Sectional Doors are vertically-opening doors constructed using multiple panel sections built to withstand wind loads using double skinned steel on foam filled panels with aluminum frame The vertical opening mechanism in these doors creates more space in front, behind and sides of the door in order to utilize more room inside the building. 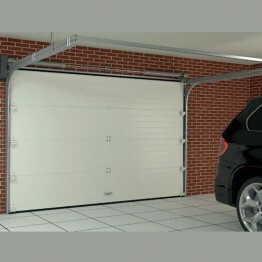 When the sectional door is open, it neatly folds up and lay flat beneath the ceiling. For angled roofs, there is provision of different type of sliding mechanism such as Vertical Lift, Standard lift High Lift & Low Lift as suitable to headroom space avaiable on top of the door opening. 1. 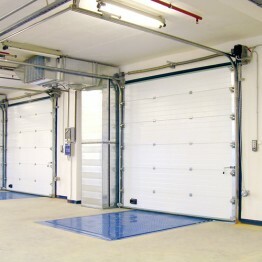 Sectional Door for Garages/ Residential purpose. 2. 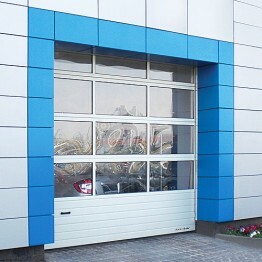 Industrial Sectional Doors for Industry, Factories, Commercial establishments.